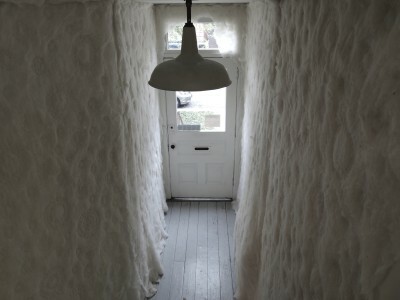 Ghost Field is a collaborative performance/installation at Perry Farm in Bourbonnais, IL made with Joanne Aono in 2016. 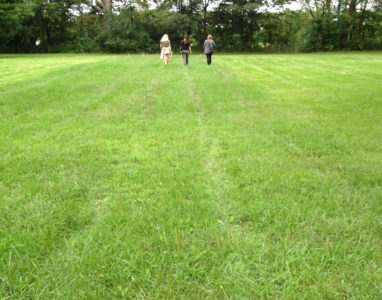 Invited by curator and artist Sherri Denault to participate in "An Unexpected Pause," a group exhibition of installations at Perry Farm, Joanne and I decided to invite visitors to make our piece, Ghost Field, by walking the lines we marked with flags, creating lines in the grass with their steps that mimicked the lines farmers made in the fields with their work. Echoing the action of Perry Farm's first immigrant farmer, Thomas Durham, the piece is a meditation on human interaction with land and the increasing mechanization of farming over the past two centuries. Recognizing that the act of erasure can be an act of healing, and that communities are built on the support and assistance of others, this collective erasing is a direct response to the suffering around us, an offering to come together and work on a challenging task. 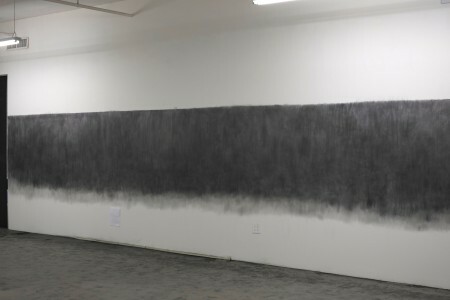 Visitors are invited to erase their regrets, desires, prayers, or any message that needs attention or mending into the graphite, or to simply help erase the graphite from the wall wordlessly. Graphite is messy to apply and difficult, if not impossible, to erase completely, yet the act of erasing gives us the opportunity to slow down and thoughtfully work together. 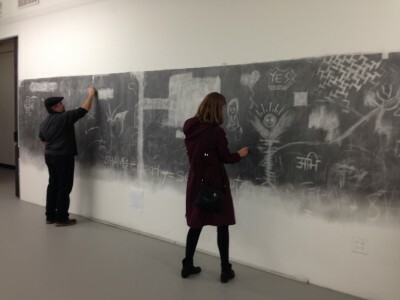 Echoing the final blowing away of a sand mandala painting, or the washing and cleansing that follows any act of disruption or violence, the mending wall is a drawing-by-erasure made communally, containing the personal and collective in one action. Installed at Mana Contemporary, February 21, 2016. September 2015. 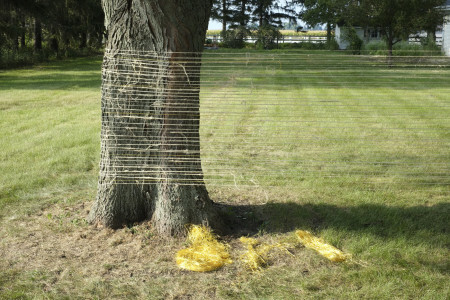 Invited by artist Joanne Aono to make an installation at Bray Grove Farm for the Terrain Biennial, I installed "Study of the Forbidden Stitch," a three-dimensional line drawing made of sisal twine and real gold thread (old/new stock from Japan used to make obi and kimono) strung between two trees on the lawn of the farm house. 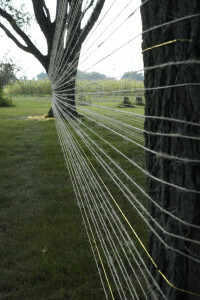 Echoing the woven and wound installations of Anne Wilson's Walking the Warp and To Cross (Walking New York), and the movement of the farmer and his equine helpers as they walk in uneven, hand-drawn lines across the farm's field, the drawing was difficult to install and vulnerable to sagging within hours or with the first rain, as the twine broke easily and was prone to disintegration. The precarious nature of the drawing reflects the nature of farming itself, as the farm's success depends on the consistent physical labor of the farmers and their mules, the weather, and other relatively unpredictable elements. As a series of parallel lines strung low between tree trunks, the drawing became an added visual to the horizon that is noticeably present at the farm. Bound by a white fence and surrounded by the tall standing corn of neighboring farmers' fields, the site opens up to the sky on a decidedly human scale, free from the massive verticality of the city just 70 miles northeast. 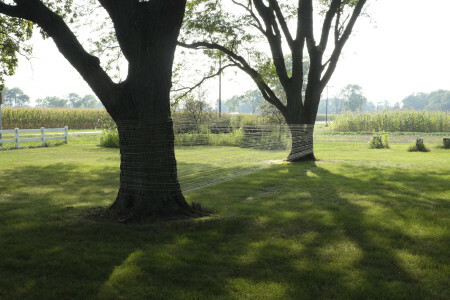 My husband helped me install the piece, and as we walked to stretch the twine between the two trees, we slowly wore a path into the grass on either side of the drawing, marking the ground just as the farmers leave their marks when they work the field. 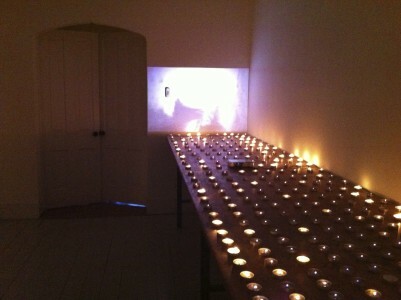 I wrote a poem years ago titled 'Studies of the Forbidden Stitch' which relates to this installation. 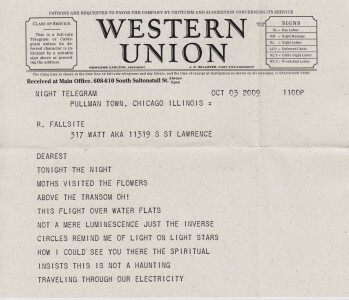 Material Passes Through Material Is an image/text video “altar.” The piece combines digitally manipulated original and found footage with text extracted from Shadow Land, the 19th century memoir of a well-known spiritualist and medium of the period, Elizabeth D’Esperance. 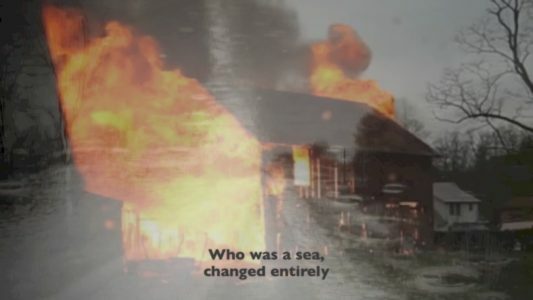 The short film is concerned with memory, loss, and “nostalgia for the future,” or “nostalgia for what never came to pass.” The film is approximately 5 minutes long and was presented in a continuous loop. 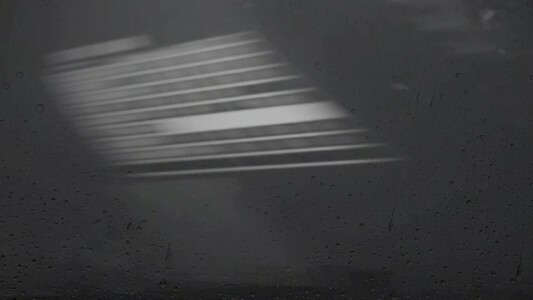 I am working on additional video 'chapters' from Shadow Land. 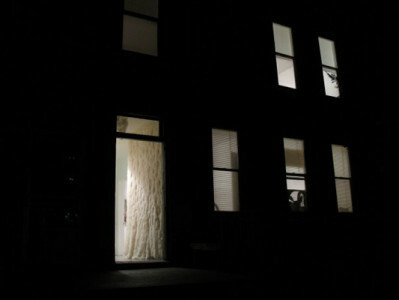 Final Voyage is an oversized wool quilt made of felted discarded sweaters and silk embroidery thread. 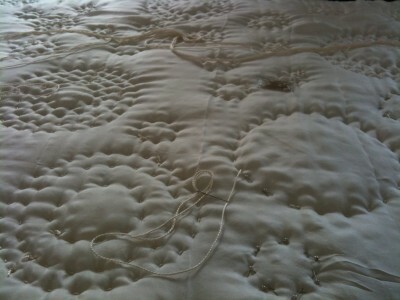 The entire quilt was sewn by hand. 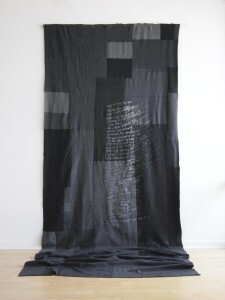 I embroidered three versions of the poem onto the quilt, ‘erasing’ the previous version with a steel wool brush. The quilt was an answer to a question: what would a fisherman make on the last voyage, when there are no more edible fish left in the sea, only jellyfish? This piece is part of the Drunken Forest series and was exhibited at Governors State University in 2013.